In case you have any questions please contact someone from our team or call our hotline. 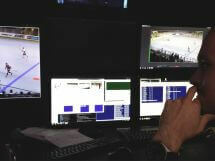 Playo.tv is a production company specialized in professional live internet broadcasts of sport and cultural events. The ideal example of our production are events and sports, which have stood so far unfairly on the edge of the interest of the classic public or private television. They offer at lower costs almost the same comfort and quality as the classic television broadcasts, including the possibility of the spread of our signal also to the TV screens. Playo.tv (formerly Střižna.cz) was established by the end of the year 2005 as the service organization, providing techniques and equipment for the production and distribution of television programmes for the project of the internet television tv.czechinfo.aero. It is operated by the company PLAYO Production s.r.o. We offer to viewers, for more than 8 years, direct broadcasts from a wide range of sport matches, tournaments and cultural events. Currently, Playo.tv is the production company with professional technical facilities, an excellent team with a lot of experiences from more than thousand of already broadcasted transmissions. We constantly follow new trends and we try to choose the most attractive content of offered broadcasts and services. We arrange live internet broadcasts, which offer previously unprecedented opportunities for events’ media promotion organized by you or by your clients, whether they are sport events and competitions, congress news, workshops or congresses, company presentations, advertising shows etc. Playo.tv offers complete technical facilities for providing of the professional solution of direct internet broadcasts. Thanks to our continuous development and trend monitoring in audiovisual and broadcasting technologies, we are able to produce and distribute a professional audiovisual material of a very high quality from any place, where the internet connection with the minimum capacity of 6Mbps upload and the electricity connection of 400V is available. Due to the optimization of production processes we are able to provide these services to our clients for available prices. The aim of our company is to offer to you the broadcast from different categories of events, which, in addition, you will not find in public or private televisions’ programme. Besides these events, which are unjustly neglected, we are of course present at many events from the sport field, for example various Europe Championships or World Championships. Except these mainly sport events, we also try to offer broadcasts from another cultural events, which enrich the basic programme offer. We hope that you like our offer and we would like to thank you for your support. 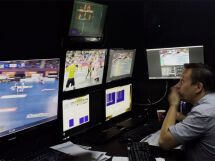 The data stream containing a video signal distributed on the internet is created by coding of the output television signal from the broadcasting vehicle into the desired compression. The data stream is subsequently uploaded to our video server, where it is recoded into several resolutions and distributed over CDN servers to end viewers. You can watch any events’ broadcasting live on our website or on our clients’ website. For the purpose of the production of direct broadcasts and records we have available our custom-developed broadcasting vehicle. Our mobile television studio allows us processing of up to 12 Full HD video signals, including an addition of repeated shots, keyed dynamic graphics and audio signal 5.1. 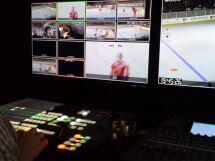 Further, we have professional camera technologies, including 10-meter camera crane and other equipment needed to the complete processing of the Full HD live broadcast.